In his manifesto on “Emotional Architecture”, first published in 1954, shortly after the inauguration of his Museo Experimental El Eco, Mathias Goeritz writes on the significance of the central patio within his overall design for the building. He describes his desire for this enclosed space to provoke a sense of mystery, to recall a small plaza and to serve as the culmination of an emotive state that is initiated at the entrance of the museum. Within the choreography Goeritz produced in this building, the viewer moves from the shadowed hallway of the entrance, to the black tower of the main gallery and then into the bright light of the patio, with its tall yellow tower. This dramatic sequencing of darkness into light creates a narrative experience for the viewer, one closely tied to the spiritual aspirations of the German artist. It is specifically within the spiritual theatricality of this museum, that the Mexican-born, São Paulo-based artist Hector Zamora positions his artistic intervention, titled Offered Paradises. 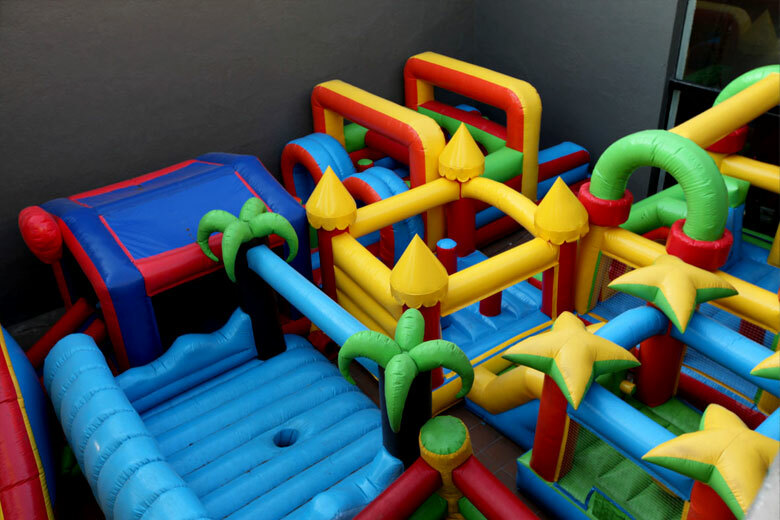 The artist has filled the central patio with a multitude of mini-architectures, the brightly colored inflatable castles, arches, mountains and ramps that are normally rented to entertain children during birthdays or other family celebrations. 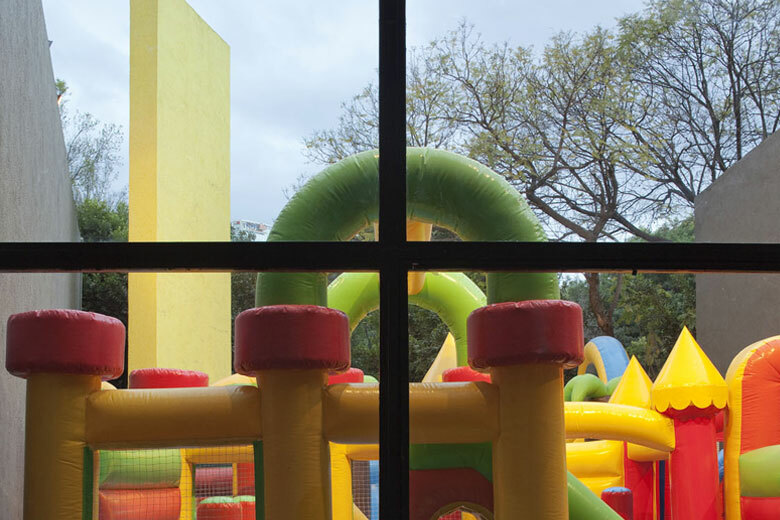 He has closed the entrances to the patio, denying access; a gesture that transforms the space into a gigantic box, open to the sky, but sealed along its sides and filled to the top with these gigantic toys. The viewer is only allowed visual access to this fantastical, inflatable world, to gaze at it through the large square window of the main gallery, a staging that evokes the experience of looking through a shop window at desirable commodities. The artist has placed a single element within the interior of the building, a framed photograph, hung on the surface of black tower. 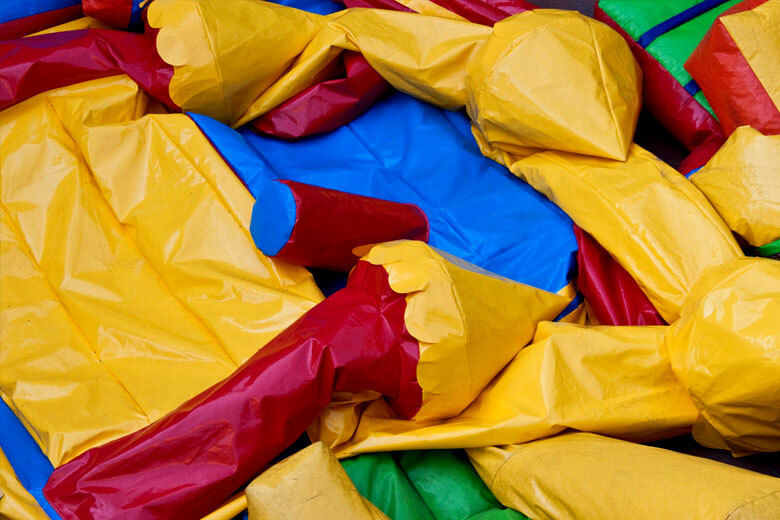 It portrays these plastic elements deflated in the patio, as flat, wrinkled shapes. 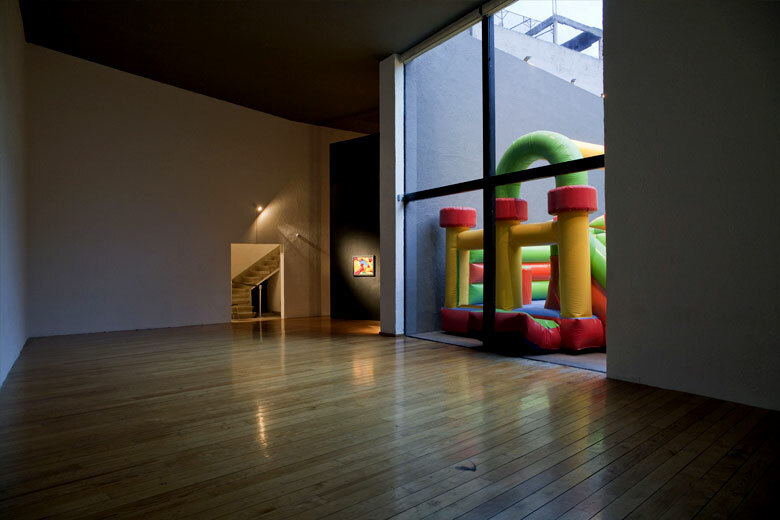 Inflatable sculptures have featured prominently in the recent work of Zamora. The artist has described his interest in these elements as primarily formal. He is drawn to the transformative play they establish as they move from two dimensions into three, which symbolically references a transition from painting to sculpture. These investigations are emphasized in Offered Paradises by the photograph the artist has included, whose two-dimensional format and subject both reference painting, while concurrently offering a comparison between the flat elements depicted and the three-dimensional, sculptural forms on view in the patio. 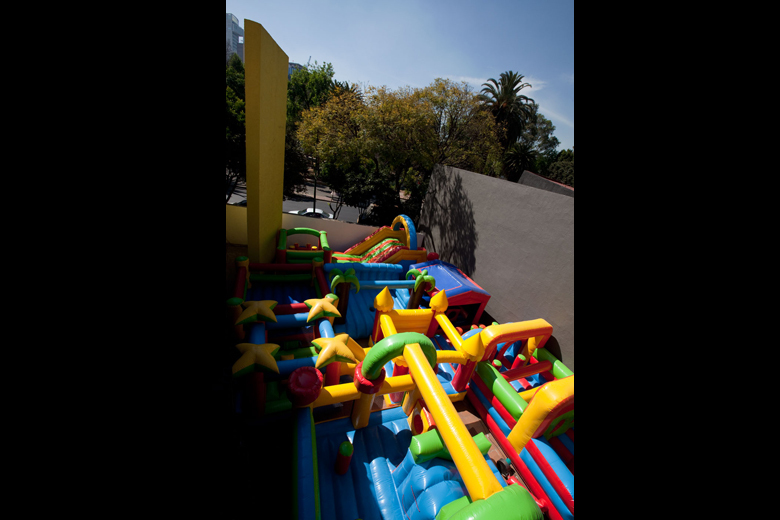 Most of the recent projects by the Mexican artist involving inflatable forms have been produced for art fairs or biennials, contexts that give his use of these materials a site-specific character. 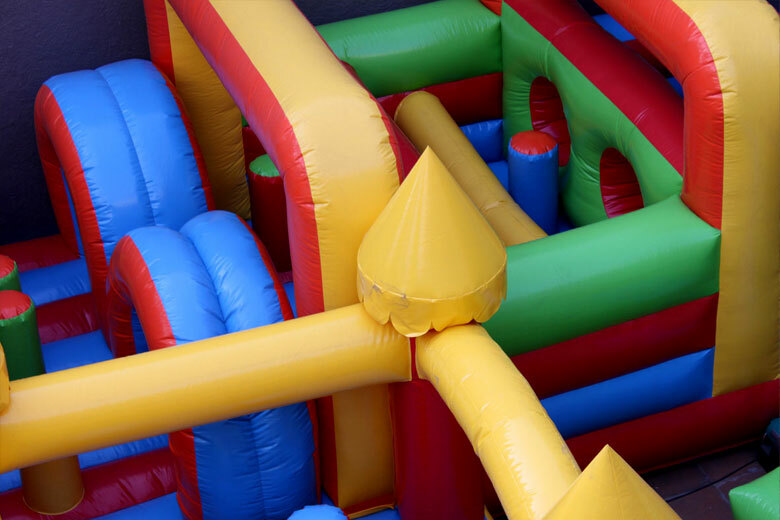 Within a contemporary context, inflatable structures are often placed along highways to advertise car dealerships or other businesses, while historically their forms have been used for diversion or sightseeing, in the form of hot-air balloons or blimps. 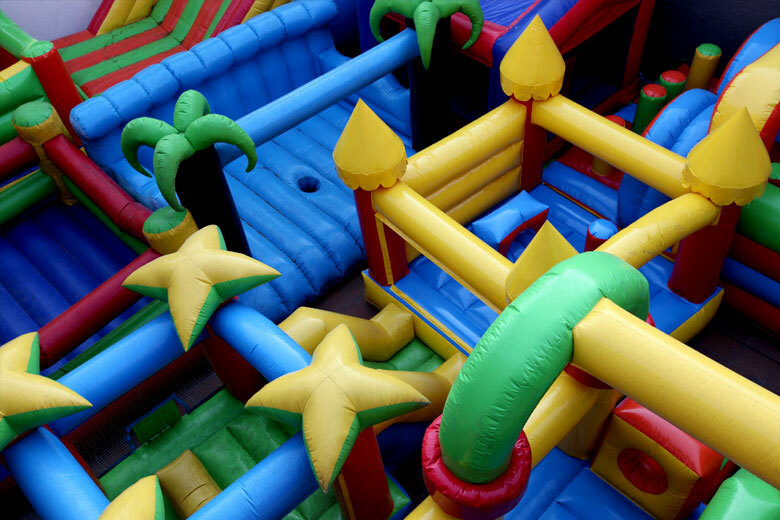 Within the spectacle of art fairs and biennials, the inflatables Zamora constructs become a critique of the commercial or high-end entertainment environments that these cultural contexts have come to represent. Spectacle informs the cultural critiques that the current installation establishes. Perhaps the first spectacle Offered Paradises addresses is that of High Modernism, its historical weight and spiritual aspirations, as exemplified by the building and manifesto produced by Goeritz. The structures chosen by Zamora reference the architectural of El Eco and geometric abstraction in general, but challenge the seriousness of these cultural sites, through their status as temporary and silly constructions, offering themselves as primal and simplistic examples of emotive architecture. 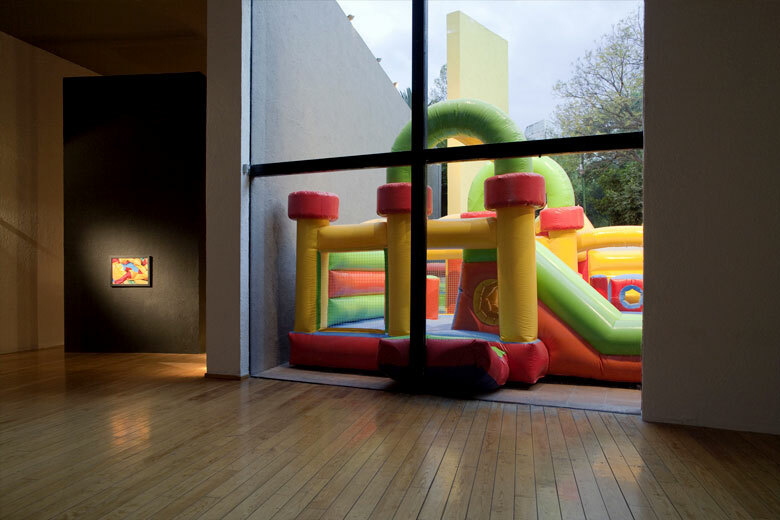 The artist additionally sees these inflatable toys as particularly ubiquitous in Mexico and his more acute reference to spectacle involves a critique of his native country. In the past years, the government of Mexico has invested heavily in dramatic public spectacles, the ice-skating rinks and snow in the Zocalo, or the parades and aquatic events on Reforma Avenue. These extravaganzas multiplied during the Bicentennial year of 2010, but have come to characterize the current presidential administration and its political strategies. These kinds of events offer to a public increasingly burdened with unemployment, drug-war violence and general insecurity, a paradise of entertainment. They evoke sites of wealth, travel and leisure that are inaccessible to the majority of the population of Mexico and as such represent Â¨castles in the air,Â¨ unreachable aspirations. 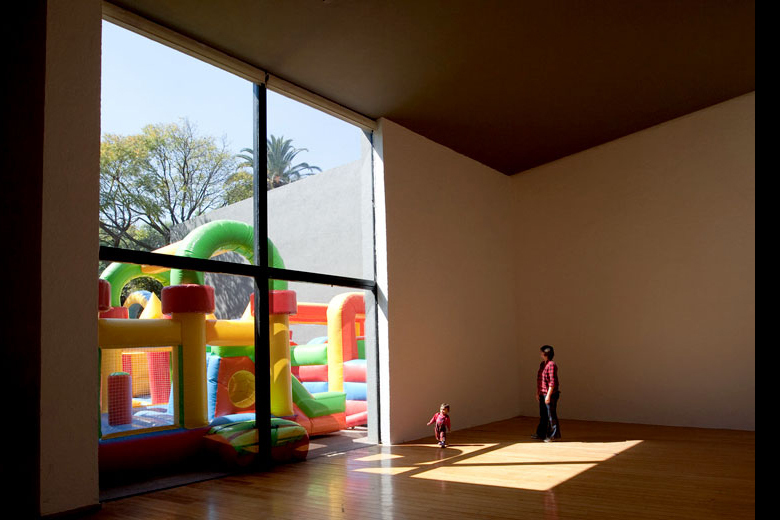 The inflatable castles and temporary entertainment structures of the installation directly reference these political dynamics, most acutely through their inaccessibility, how Zamora denies access to the temporary pleasures that these forms offer, by sealing them behind the glass doors and windows of the museum.